With butter, lightly grease bottom and sides of 8 1/2 x 4 1/2 x 2 1/2 or 9 x 5 x 3-inch loaf pan. Dust with flour. Shake out excess flour. Set aside. Into bowl or onto sheet of waxed paper, sift 1 1/4 cups flour together with the cocoa and salt. Set aside. In large mixer bowl at medium speed, beat together butter and sugar until light and fluffy, about 3 to 5 minutes. Beat in eggs and vanilla until thoroughly blended, at least several minutes. At low speed, gradually beat in reserved flour mixture, 1/2 cup at a time, beating just until blended and no streaks remain. Stir in chips. Spread batter evenly in prepared pan. Bake in preheated 325° F oven until cake begins to pull away from sides of pan and cake tester inserted near center comes out clean, about 60 to 70 minutes for 9-inch pan or 75 to 85 minutes for 8-inch pan. (If the tester shows dark brown, you've hit a melted chocolate chip. Test again in another spot. To prevent overbaking, remove the cake from the oven as soon as no light brown batter shows on the tester.) Cool on wire rack 10 minutes. With narrow spatula or knife, loosen cake from pan. Gently shake onto wire rack. Cool completely. To retain moisture, store cooled cake in plastic wrap. 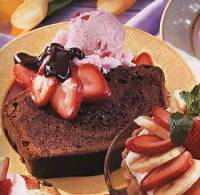 Serve plain or topped with berries or other fruit, ice cream or whipped cream, if desired. My family didn't like it at all. This is one of my favorites. Its so simple, but turns out so good! I usually just use dark chocolate instead of chocolate chips in the recipe.